I love this bread! I have been told by several European travelers that it tastes just like the great bread they loved in Europe. 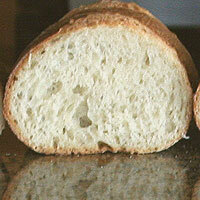 The crust is crisp and crusty, the inside is airy, chewy, and delicious! Combine all ingredients and knead 8-10 minutes. Check the dough after 5 minutes. It should be takcy. This is the point just after (1)sticky. To test it, touch it firmly with one finger and pull away quickly. Your finger should be clean, but just barely. It should not feel (2)dry or stiff. If it is sticky add more flour 2 T (.5 oz) at a time. If it is dry and stiff add (3)water 2 T (.5 oz) at a time. (4)tearing. The dough pictured is done kneading. Gently remove the dough from the bowl. Handle it carefully so the air pockets won't get pushed out. Divide the dough in half. They should weigh 1 lb 4 oz each. Lengthwise, fold the bottom third up and the top third down overlapping the bottom third. Using your thumbs press the new bottom fold down sealing it with the rest of the dough. Wrap the ends in and seal them to the bottom as well. Roll the dough so the seam is on the bottom and gently rock the dough back and forth starting from the middle stretching it to the desired length. Pinch the seam while doing this to have a tight and even skin. If there are large air pockets that rise to the surface gently (6)pop them. Pour flour, cornmeal, or semolina on the your work surface, dip the bottom of the bread in this and place on an inverted cookie sheet. Repeat the above process with the remaining dough. The next day remove the dough from the refrigerator and gently place one loaf on a peel dusted with cornmeal or semolina. Place the other loaf on a counter dusted with cornmeal or semolina. Let them sit lightly covered 1-2 hours at room temperature. Check them occasionally to make sure they aren't sticking. If they are place some semonlia or flour on the sticky spot. Prepare the oven. Position the top rack on the second to highest setting. Position the bottom rack to the lowest setting. Remove any other racks. Place the baking stone in the center of the high rack. Place a (8)steam pan on the low rack. Do not use a glass container for this! It will shatter when you pour the water in. Preheat the oven to 500, (9)20-30 minutes before baking. Get 1-2 cups of hot water and set it by the oven. 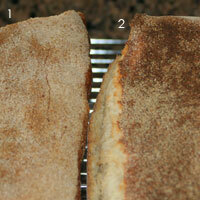 Score each loaf three times in a diagonal direction at a 45 degree angle about 1/2 inch deep. Make sure the loaves are not stuck on the peel. 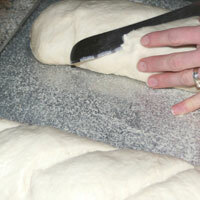 If they are sticking gently lift the loaf and put more semolina, cornmeal, or flour underneath it. Working quickly, slide one loaf at a time onto the hot stone. One will be in back the other in front. Pour the cup of water into the steam pan. Quickly shut the oven. Set a (10)timer for 3 minutes. After 3 minutes turn the oven down to 450 degrees. Bake 12 minutes more. Change the back loaf to the front and the front to the back while turning them both 180 degrees. Bake another 10 minutes. Check the loaves. They should be a rich brown color, if they are starting to blacken (which they probably aren't) remove from the oven and place on cooling racks. If they are dark brown, turn the oven off and keep the bread in for another (11)5-10 minutes. Wait 2 hours before slicing and serving the bread. If you cut into it before it cools it will become gummy and the taste won't be quite right. Eat the bread the same day it is baked. If you don't you can freeze it. You can slice and freeze or freeze an entire loaf. Don't refrigerate, it tastes funny and loses it's great texture. 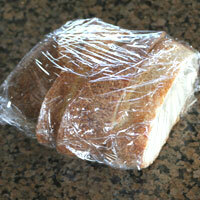 Wrap a whole loaf or sliced pieces tightly in plastic wrap. Freeze. The differences were actually very slight. 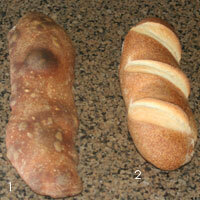 If they hadn't been compared side to side it would be hard to tell what was wrong with each loaf. 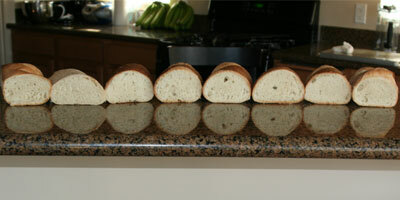 The culprits of the four worst loaves were: undermixing (1), low oven temp (7), making it the same day (8), and too much flour (2 in the second picture). The rest tasted good, but were not perfect (except for #5). 1. 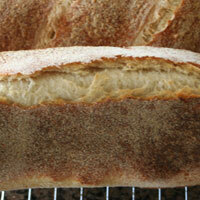 Too little flour - This bread most often gets ruined by putting too little flour in the dough. This makes the loaves flat and the bread gummy. Check the flour 5 minutes into kneading. 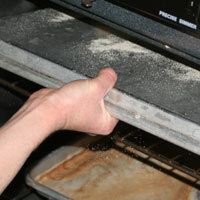 If you check it too early, it will feel tough and seem to have too much flour. It settles in after about 5 minutes, so this is a more accurate time to check it. It should not be sticking to the bowl while kneading, but just barely. If you're going to err in this recipe, err on the side of too much flour. The loaves will still look good and taste better than a flat sticky loaf. 2. 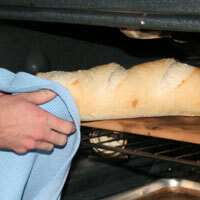 Temperature of the dough too warm - The second most common way to ruin it is by the temperature. If the water is too warm the dough rises too fast. 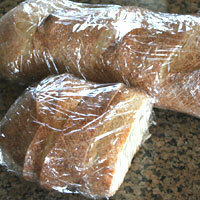 If it rises too fast on the counter, it will probably rise too much during the overnight refrigeration. This is a problem because they will most likely deflate when they are transfered, or they will not have enough strength to finish the rise in the oven and will deflate there. Use very cold water for the dough. A slow rise is desireable. If my house is hot I refrigerate the dough during the autolyse (first 15-20 minutes of the rise). I then check it every 20-30 minutes during the fermenting period (first rise after autolyse). 1. Combine all ingredients except the cornmeal or semoline. Knead 8-10 minutes. Check the dough after 5 minutes. It should be takcy. This is the point just after (1)sticky. To test it, touch it firmly with one finger and pull away quickly. Your finger should be clean, but just barely. It should not feel (2)dry or stiff. If it is sticky add more flour 2 T (.5 oz) at a time. If it is dry and stiff add (3)water 2 T (.5 oz) at a time. Stretch the dough between your fingers to do the window pane test. It should form a thin gluten window without (4)tearing. The dough pictured is done kneading. Form into a ball and place back in the bowl. Cover with plastic wrap. 2. Let it sit for 15-20 min (autolyse). It will not show signs of rising by this point. Knead it by hand for 30 seconds. Reform into a ball and cover with plastic wrap again. Let it rise (5)45-90 min. 3. Gently remove the dough from the bowl. Handle it carefully so the air pockets won't get pushed out. Divide the dough in half. They should weigh 1 lb 4 oz each. Lengthwise, fold the bottom third up and the top third down overlapping the bottom third. 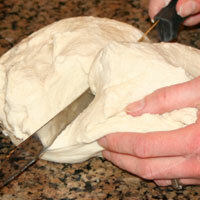 Using your thumbs press the new bottom fold down sealing it with the rest of the dough. Wrap the ends in and seal them to the bottom as well. Roll the dough so the seam is on the bottom and gently rock the dough back and forth starting from the middle stretching it to the desired length. Pinch the seam while doing this to have a tight and even skin. If there are large air pockets that rise to the surface gently (6)pop them. Pour flour, cornmeal, or semolina on the your work surface, dip the bottom of the bread in this and place on an inverted cookie sheet. Repeat the above process with the remaining dough. 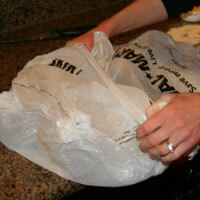 Cover the cookie sheet with plastic wrap or two plastic grocery bags. (7)Refrigerate overnight. 4. The next day remove the dough from the refrigerator and gently place one loaf on a peel dusted with cornmeal or semolina. 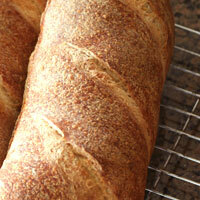 Place the other loaf on a counter dusted with cornmeal or semolina. Let them sit lightly covered 1-2 hours at room temperature. Check them occasionally to make sure they aren't sticking. If they are place some semonlia or flour on the sticky spot. 5. Prepare the oven. Position the top rack on the second to highest setting. Position the bottom rack to the lowest setting. Remove any other racks. Place the baking stone in the center of the high rack. Place a (8)steam pan on the low rack. Do not use a glass container for this! It will shatter when you pour the water in. Preheat the oven to 500, (9)20-30 minutes before baking. Get 1-2 cups of hot water and set it by the oven. 6. 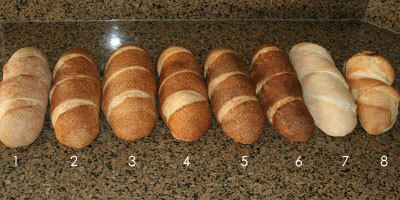 Score each loaf three times in a diagonal direction at a 45 degree angle about 1/2 inch deep. Make sure the loaves are not stuck on the peel. If they are sticking gently lift the loaf and put more semolina, cornmeal, or flour underneath it. Working quickly, slide one loaf at a time onto the hot stone. One will be in back the other in front. Pour the cup of water into the steam pan. Quickly shut the oven. Set a (10)timer for 3 minutes. After 3 minutes turn the oven down to 450 degrees. Bake 12 minutes more. Change the back loaf to the front and the front to the back while turning them both 180 degrees. Bake another 10 minutes. 7. Check the loaves. They should be a rich brown color, if they are starting to blacken (which they probably aren't) remove from the oven and place on cooling racks. If they are dark brown, turn the oven off and keep the bread in for another (11)5-10 minutes. 8. Remove from the oven and place on a cooling rack to cool. The bread will continue to bake while it sits. Wait two hours before slicing and serving the bread. If you cut into it before it cools it will become gummy and the taste won't be quite right. Eat the bread the same day it is baked. If you don't you can freeze it. You can slice and freeze or freeze an entire loaf. Don't refrigerate, it tastes funny and loses it's great texture. 1. Too little flour - If there is not enough flour, the bread will not be able to hold it's shape. It will bake a litle flat, or may deflate completely and be very flat. It will also be a little gummy and sticky. 2. Too much flour - Too much flour of course makes a dry loaf of bread. If you're going to err in this recipe, err on the side of too much flour. The loaves will still look good and taste better than a flat sticky loaf. 3. 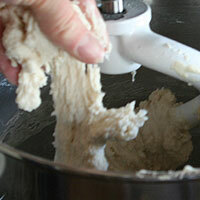 Adding water - Adding water may take some kneading by hand until it's incorporated or it may splash out of the bowl. 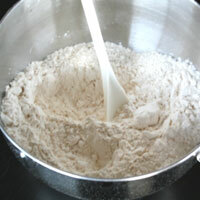 It's always eaiser to add more flour than it is to add more water. 4. 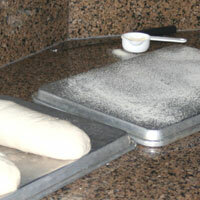 Tearing or Stretching - If the dough tears before a thin window is formed the gluten is not developed. If it stretches to form a thin window, it is ready. 5. 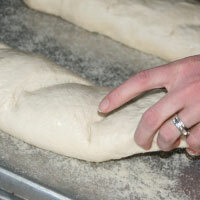 Time of rise - The length of the rise will vary greatly depending on the temperature of the water, dough, and room. The dough should swell a lot, but still have a round shape. It should not be stuck to the sides of the bowl. 6. 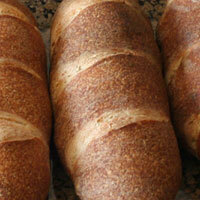 Air pockets - If air pockets rise to the surface while forming the loaves, gently pop them. If you don't they can get very large during the refrigeration and when you tranfer them, they may pop and deflate the dough completely. If it doesn't pop it still may ruin the loaf by expanding in the oven leaving the loaf with huge air pockets just under the crust. 7. Refrigerating dough - Refrigerating this dough for at least 8 hours is necessary to the structure of both the crust and interior of the bread. See problems for more information on this. 8. Steam Pan - I use a jellyroll pan for a steam pan. It does warp it, but that's all I use it for. I like the large hot surface area it gives the water. It produces a lot of steam very quickly and the rest slowly througout the baking period. 9. 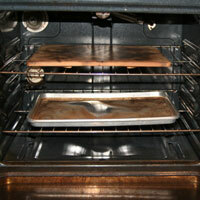 Oven heating - It will take most ovens 20-30 minutes before it can reach 500 degrees. It will register much sooner than this, but it often isn't ready. When my oven first registers at 500 it is actually at 300. Ten to twenty minutes later it will actually be at 500. If you put the bread in when the temperature is really at 300, it will ruin the loaves. The color, structure, and crust will be off. An oven thermometer is very helpful for this. 10. Timer - I don't know how many times I haven't turned the timer on for the three minutes thinking I would remember. Before I know it they have been baking at 500 for 10 minutes. I have ruined several loaves this way. 11. Baking time - Breads should be baked as long as they can be without burning. It makes the crust crisper and the inside drier as opposed to gummy. 12. 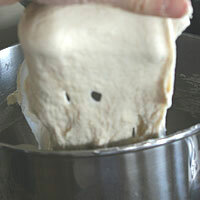 Very cold water - For the structure and taste, this dough needs a slow rise. 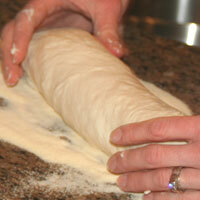 Kneading makes the temperature of the dough rise, so starting with very cold water is beneficial.